April 2019 | A.B.E. Remodeling, INC. It's April 2019. Another new month to the year so we greet you with this new chapter and new page. We're all so anxious to enjoy the spring flowers, the sounds of the birds chirping, the sunshine on our back. Finally the winter is fading into the past. Now it's the time of newness once again across the land. We take this time to wish you all the best… May the month give you courage, strength, confidence, patience, self-love and inner peace. 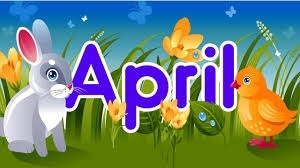 May every day in April fill your days with hope, love, sunshine and energy. Let there be joy, fun and laughter. Let us have peace in our lives. For those of you birthday "babies" we take this opportunity to wish you all a very HAPPY BIRTHDAY. As the days unfold before let's pray we hear more good news then all the bad news we hear on the media. Happy April Everyone. Enjoy the days and all the activities the month will bring. Just a few days ago, I finally saw some Robins in the yard and I find them such a welcoming sign. Oh, and if you have some spruce up remodeling jobs to be done...give us a call straight away...since we are scheduling future days. Until next posting, be blessed.